An increase in moisture and an incoming disturbance in the atmosphere will set off an area of rain, some heavy, Monday afternoon. Already, clouds are thick across the Finger Lakes this morning and will likely remain as such throughout the day. Should any breaks of sun work out, they would most likely do so over the southeastern Finger Lakes in the Elmira-Ithaca-Cortland area. The morning hours should remain primarily dry, but by 2 or 3 pm, showers and thunderstorms will start to develop over southwestern New York and the western Southern Tier. These will spread northeast into the western Finger Lakes during the late afternoon. This evening, rain will meander eastward and slowly weaken overnight. Some of the rain could come down heavily for a time, especially for more southwestern areas such as Dansville, Wellsville, and even Bath. At most, some areas will probably see 1 to 2 inches. Many areas south of I-90 and west of Seneca Lake will see over a half-inch, while areas further north and east will generally see under a half-inch, but with some locally higher pockets. Temperatures today will be warmest to the north of I-90, where low 80s will be likely. Further south, mid and upper 70s should be expected. While not as rainy as last week, this week will nonetheless have an almost daily chance for at least a couple of showers. Generally speaking though, there will be more dry time than last week and fewer downpours. At this time, flash flooding is not expected to become a major concern. 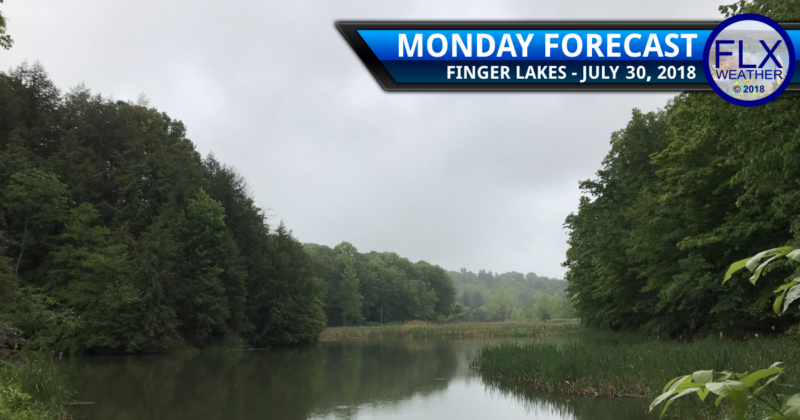 Tuesday will primarily have some morning showers scattered about the Finger Lakes, followed by some afternoon showers mostly contained to southwestern regions. Wednesday will have a better chance for rain, but it may mostly come during the first part of the morning with just some scattered activity during the afternoon. Thursday seems to have the best chance for dry weather and some sunshine before scattered showers return for Friday. In all, 50-75% of the rain that falls this week will likely do so today and tonight. Temperatures will continue to hover in the same range they have been in thanks to the clouds and showers. Expect mostly mid and upper 70s on Tuesday with some low 80s Wednesday, Thursday, and Friday. Another half inch and we will set the record for July rain here (on a 32 year norm)! Unbeliveable turn of fortune and all in the past week.